It's time to get a little wild with Safari!!! So many exotically, superb textures and elements in this wonderful collection! Lions and tigers and bears...oh my! How fun is this collection? The only thing funner would be winning the complete Safari collection! Stop by our Facebook page and enter for a chance to win this marvelous collection! Or enter below! Of those asked for in the tab, I love Star Crossed. Of the new releases, I love Garden journal! Thanks for sharing and for a chance to win! My favorite is Forever Young!! I really like Atltitude. Star Crossed is great too. My favorite of the 3 options given is the beautiful Altitude Collection. The Star Crossed is my favorite! Really cute collection. Great bright colours. Love this one and Forever Young out of the new ones. Love this! Star Crossed is my fave! Altitude is my favourite ever Bo Bunny collection, but out of the new Spring releases, I love Safari the best. I'm an animal lover, so the jungle colours and range of animals is just brilliant for me. I love Safari. My favorite collection is Star Crossed! What a fun collection! 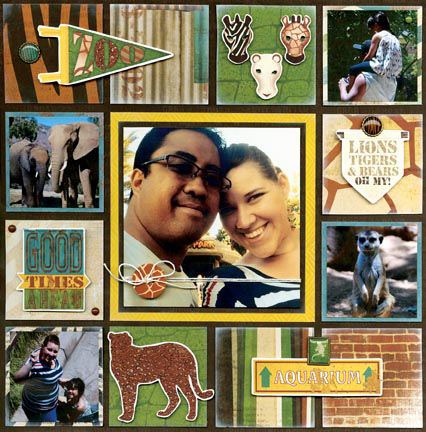 It will be great to scrapbook zoo photos with. This collection is perfect for my layouts of our trip to Animal Kingdom at WDW. My favourite collection....ummmmmm.....Altitude....no ummmm...Rose Cafe.....no ummmm....Star Crossed....Oh, I can't choose! I love them all! Altitude is my favorite of the new collections, but let me tell you it is extremely difficult to choose just one favorite!! WOW - LOVE IT ALL!!! Altitude is my favorite but they're all great!